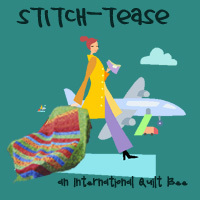 The month of May belongs to Valerie in our International Stitch Tease Quilting Bee. She chose a fun block that I've never made before: the Jacob's Ladder. She wanted eight 6" finished blocks with low volume backgrounds and a beautiful pallet of black, pink, teal, and yellow focus fabrics. 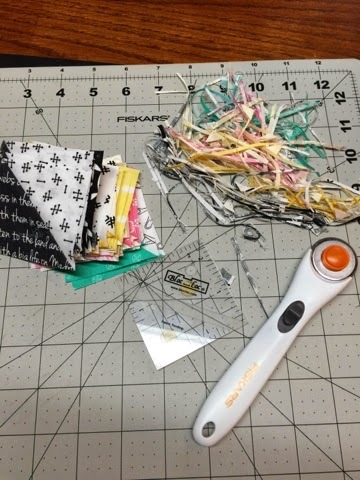 She told us we could do multiple blocks in the same fabrics, but part of the fun for me is picking out and working with different fabrics from my stash, so I chose to make 8 unique blocks. 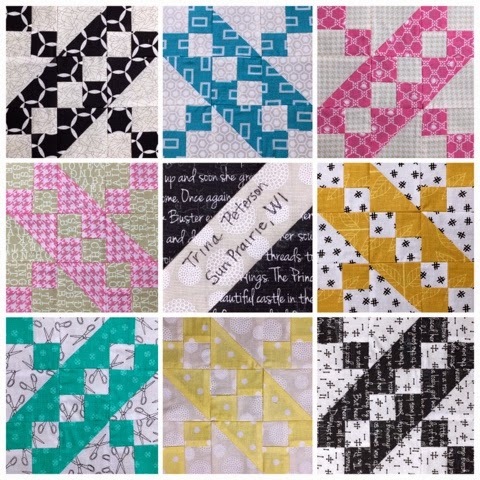 We used a tutorial from Generations Quilt Patterns as a reference for these blocks. A couple of my blocks don't have the best contrast, as you can see. That is a skill I need to improve upon in my quilting. It's nice to see all the blocks together like this, because when I look at them individually I often don't notice the value as much. I love quilts that use value more than anything else to create the pattern. It amazes me how some people have a knack for putting those together, and I hope to be able to do that myself at some point. We also made siggy blocks using the PS I Quilt method. Unfortunately I have horrible handwriting, but alas - life goes on. I can handle being known as the gal with the wretched penmanship. There are worse things in the world, eh? I also wanted to take a moment to share my obsession with Bloc Loc Rulers and my rotating cutting mat. I try a little bit not to be gadget dependent (although I'm not fooling anyone other than myself). In all seriousness, though, these tools have greatly improved the quality of my half square triangles and cut the time in half or better. They are amazing. My HSTs are darn near perfect. Every. Stinking. Time. They also make Bloc Locs for flying geese, and I definitely see a set of those in my future.